Chop 1 lb of roma tomatoes in to 1/2 cubes. Chop 1 bell pepper and 1 sweet banana pepper into 1/2 inch chunks. Mince 1 clove garlic and finely chop 2 tbsp fresh sage. In a medium sized stock pot add 2 tbsp butter over medium heat. Add minced garlic and stir until fragrant, then add peppers and tomatoes, 1-2 tsp salt, and 1/2 tsp pepper. Stirring frequently, continue cooking and as tomatoes release their juices lightly smash the vegetables. Bring the soup to a boil, then reduce to a simmer and add water if necessary. 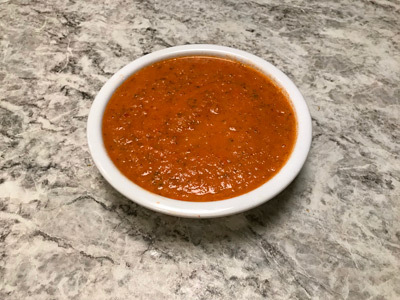 Cook soup for 15 minutes, then remove from heat and, carefully, transfer to a blender and blend until smooth, covering blender with a towel to prevent scalding by the hot liquid. Prepare 1 cup of dried white by soaking overnight, rinsing, then cooking for about 1 hour or until tender, then rinsing again. Cut two delicata squash down center lengthwise. Scoop out seeds from two halves with a spoon. Cut squash into half crescents 1/2 inch thick. Finely chop 1/4 cup of sage. In a bowl combine squash, 1/4 cup sage, 1/2 tsp ground allspice, 1/2 tsp salt, and 1/4 tsp pepper. Stir to coat squash. In a large skillet add 2 tbsp olive oil over medium heat. Add coated squash and cover, stirring frequently. As squash cooks add 1/4 water if pan becomes tacky. Cook squash until flesh and rind are tender. Remove from pan and set aside. While squash is cooking, prepare 1/2 cup of mirepoix (2 parts onion: 1 part carrot: 1 part celery, all finely chopped), 3/4 lb or about 4-5 roma tomatoes, cubed, and 1-2 cloves of garlic, minced. Once squash is cooked and set aside, add 2 tbsp cooking oil to the skillet the squash was cooked in, then add garlic, the mirepoix, and 3 bay leaves, and cook for 5-7 minutes until fragrant. Add cubed tomatoes and cook another 4 minutes. Add 1/2 lb (about 2/3 bunch) of kale, sliced into thin ribbons, 1/4 cup water, and 2 tsp salt, 1/2 tsp pepper. 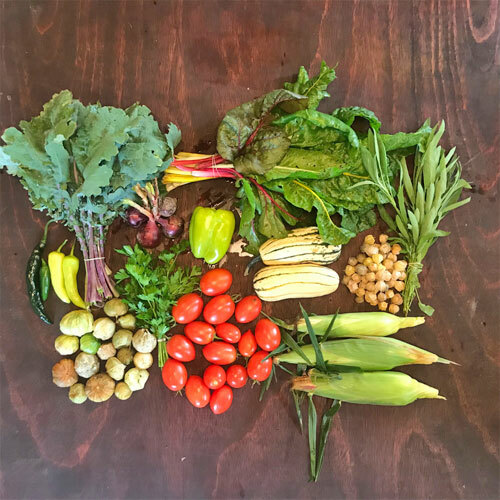 Cook just until kale is wilted, then add cook white beans, about 1 1/2 cups, and 1-2 tbsp lemon juice, or the juice of 1 fresh lemon, and 1/2-1 tsp of chili flakes. 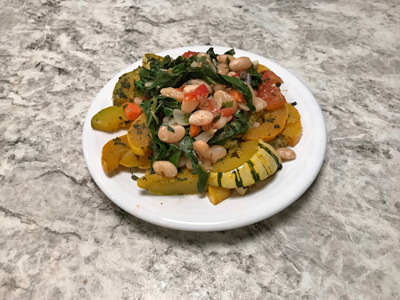 Cook until everything is warmed through, then discard the bay leaves, and serve white bean and vegetable mixture atop delicata squash. To make tomatillo sauce add 3/4lb of tomatillos, removed from husks and rinsed, and 1 pasilla bajio pepper, and 1 sweet banana pepper, both whole with tops removed, to a small saucepan with enough water to cover everything. Cook for 8-10 minutes, or until tomatillos are tender. Transfer to a blender and add 3 tbsp sour cream, 3 cups of roughly chopped Swiss chard, 1/2 cup parsley, 2 tsp salt, 1/2 tsp pepper, and the juice of 1 lime, about 1-2 tbsp. Blend until smooth, then transfer back to saucepan and cook over low heat until sauce has thickened. Mince 1-2 cloves of garlic and add to a large skillet with 1-2 tbsp cooking oil. Cook garlic 1-2 minutes until fragrant, then add remaining roughly chopped Swiss chard and 2 tbsp water, 1 tsp salt, and cook until Swiss chard is tender. Remove from heat and stir in 1/4-1/2 cup of queso cheese (or mozzarella). 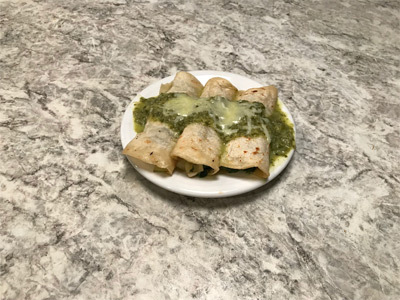 To prepare enchiladas, heat 1 tsp oil in a large skillet over low heat and add 6 inch corn tortillas, toasting each side for 15-30 seconds, then add Swiss chard mixture, roll tortilla, and dress with tomatillo sauce and queso cheese. 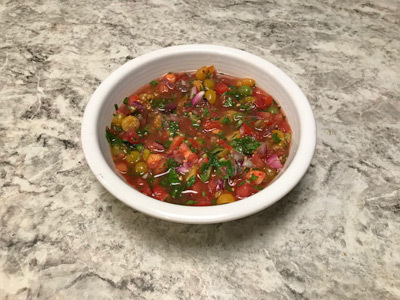 Combine 4-5 roma tomatoes (about 3/4 lb), finely chopped, 1/4lb of ground cherries, removed from their husk and roughly chopped, 1/4 cup finely chopped red onion, 1/4 cup finely chopped parsley (or cilantro if preferred), 1 jalapeno pepper, finely chopped (for less heat remove ribs and seeds), 1 tsp salt, and 1 tbsp fresh lime juice. Stir to combine, refrigerate, and allow flavors to meld for several hours before serving. Serve with chips, over eggs, or as a fresh salad.Add 2 tbsp of cooking oil to a large skillet over medium-low heat. Add 2 cloves minced garlic and saute for several minutes. Cut collard greens leaves into 1 inch ribbons, and finely chop the leaf stems (if desired). Add the stems to the skillet and cook for several minutes, then add the greens and 1/4 cup of water. Add 1-2 tsp of cajun spices, 1 tsp salt, and cook for 10-15 minutes, stirring frequently, until greens are tender. Add 1 tbsp apple cider vinegar, and serve. Bring a large stockpot of water to a boil. 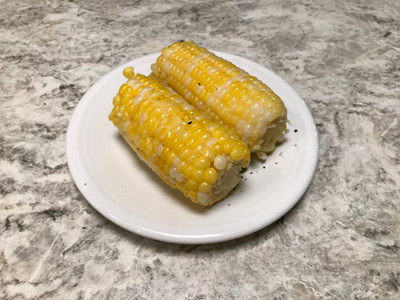 Remove from heat and add 3 dehusked ears of sweet corn. Allow to cook in heated water for 10-15 minutes, until kernals are tender. Serve with butter, salt and pepper.